Clamanges is located in the Marne departement in champagne-Ardenne region (now part of Grand Est new region), in the North-East of France at 25 km from Châlons-en-Champagne, the prefecture (Clamanges is at 120 km from Paris). Places to visit in the nearby are Épernay and Châlons-en-Champagne at 25 km. 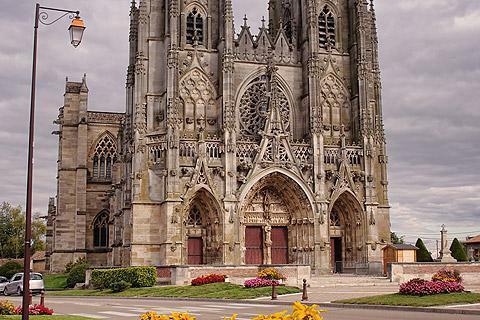 Further - at 70 km, you will find the historic Champagne capitals: Troyes and Reims . The town of Epernay, well known as capital of the Champagne producing region of France, is a wealthy looking town because of the expensive 19th century townhouses and mansions constructed with the wealth derived from the champagne trade. The Avenue de Champagne is the place to start your tour of the grand champagne houses and is also the place to start your visit even if you are not interested in champagne, because it is along this Avenue that many of the most impressive houses and chateaux in Epernay are to be found. Moet & Chandon and Mercier are the most popular champagne houses for a quick introduction to the champagne experience (called a "degustation" in French), although there are also many smaller producers open to visits in the town. At Castellane - you can't miss it because their 1905 tower dominates the town - you also get good views across the town included in your visit. Places of interest in Epernay. Epernay has been attacked and almost destroyed numerous times during its long history. As a result there is little remaining here from the medieval period. The '<b>Portail Saint Martin</b>' is the oldest monument in the town and is an impressive stone doorway that is all that remains of the 16th century Church of Notre Dame. Two particularly noteworthy villas that you will see as you explore the town are the Town Hall and its impressive gardens (built in 1858) and the Chateau-Perrier, built in 1854 and notable as being the headquarters for the British, the Germans and then the Americans all during the Second World War. The Gabrielle-Dorziat theatre also has an impressive facade. The most important religious monument in Epernay is the Church of Notre-Dame (the church has the appearance of being much older than 1925 when it was rebuilt after war damage). The 12th century Collegiale Church of Notre-Dame-en-Vaux which is important enough to be listed as World Heritage Site as one of the list of monuments on the important medieval pilgrimage routes through France. 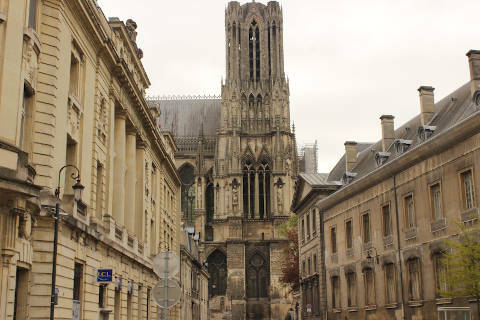 The cathedral is mostly in gothic style, and a very impressive design with two spires to the front and two towers with decorative arches to either side of the chevet at the rear of the church (these were also originally spires but these were removed during the revolution). The village of L'Epine, in the agricultural landscape of the quiet Marne countryside would go unnoticed if it were not for the presence in the village of one of the most important historical landmarks in the Champagne-Ardenne region. Notre-Dame de L'Epine basilica The basilica was built from the early 15thcentury onwards, in a project that was to take more than 100 years to complete (the cathedral was finished in 1527) and in what is known as the 'flamboyant gothic'. The entire facade is ornately decorated, including the main entrance and two side entrances, and the substantial (and irregularly sized) towers to either side. You probably won't notice but the left hand spire is actually a 19th century reconstruction of the original. The facade also has a good number of carved gargoyles, including some very unusual designs - such as a crocodile or unrecognisable beasts fighting - to provide entertainment to your children if they are not usually enthusiasts of medieval architecture! Among the most notable artefacts within the basilica at Epine you can see a wooden sculpture of Saint-Jacques, dating from the 16thcentury. The basilica is also well known for its carved stone 'rood screen' ("jube" in French) between the nave and the choir sections, and a statue of the lamentation of Christ (also called "mise en tombeau") representing various charaters around Christ as he is placed in his tomb. Because of the historical importance of the basilica as one of the sites along the medieval pilgrimage route to Compostella the basilica is now listed as a UNESCO world heritage site (as are about 70 other monuments along the same routes). 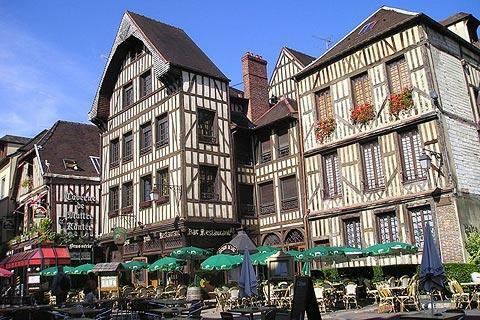 Troyes is in the Aube department of the Champagne-Ardenne region, on the Seine River. The city describes itself as "La cite en forme de bouchon de champagne" (trans: the city in the form of a champagne cork) although this is more noticeable from aerial views than from exploring the town on foot...! Your visit will focus in the Place de l'Hotel-de-Ville, the main square in central Troyes, and along the bustling Rue Emile Zola, the principal street through the town centre. < sup=""> century) can be seen. Another particularly important building in the centre of Troyes is the Hotel du Lion Noir (dating from the 16th century) and especially interesting because of its external staircase, open to the elements and made from wood, which is very unusual. Among the other notable buildings from this period see the Hotel de Marisy, the Hotel de Mauroy (which contains a museum of traditional artisan tools) and the Hotel of the Prefecture Building for the Aube department. < sup=""> - 17th century) dominates the centre of Troyes, and is decorated with many carved highlights (gargoyles, etc) above all on the west facade. Highlights inside the cathedral including some fine stained glass windows and a reputed organ. 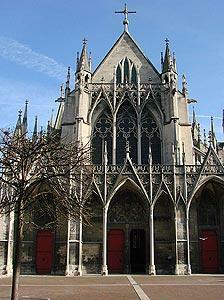 There are also several interesting churches in Troyes, each with their own distinct features and attractions. See in particular the 12th century Church of Saint-Madeleine (the oldest church in Troyes, featuring some exceptional stone carvings); the Saint-Remy church and the 'clock' on the belltower; the Church St-Jean-du-Marché, where Henry V married Catherine of France; and the Saint-Urbain Basilica. < sup=""> Medieval Troyes The town is also described as having one of the finest medieval centres to be seen in France - and it is certainly true that the old town in Troyes is a lovely ensemble of buildings, with streets of tall colombage houses surrounding the attractive cathedral. It is centred in the Saint-Jean sector of Troyes (next to the Place de l'Hotel de Ville). Some of the streets such as the Ruelle des Chats are especially narrow - an effect emphasised by the building protruding more at higher levels until the upper stories actually touch the building opposite. 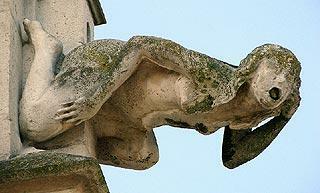 Reims is a city in the Champagne-Ardenne region, in the north of France. Although Reims suffered very badly during bombing in WWI, its historical centre contains a great deal of interest. Your visit to Reims will focus in the centre and around the cathedral and other major monuments, and the main squares: the Place Royale, with a statue of Louis XV, and the Place Cardinal-Lucon, with an equestrian statue of Joan of Arc. The rue de Vesle is the main street. Reims Cathedrale Reims is most famous for its cathedral (1211-1480), which is one of the finest examples of the 'French Gothic' architecture style. Reims was evangelized around the third century AD and a Christian basilica was first constructed here around the year 400, consecrated to the Virgin by the Bishop Nicasius. It was in this church that St. Nicasius was martyred, when the city was taken by the Vandals. Spending huge sums of money on its construction, work on the cathedral began in 1211 and continued from 1299 and throughout the 14th century. The church, in the form of a Latin cross is very large - on the outside the building is 149 meters long. The key feature of the cathedral of Reims is the sculptures and unique glass windows; for example the western portal has 35 statues and an impressive rose window, among the most notable are the small figures of angels including the famous 'Smiling Angel', one of the most famous sculptures of the cathedral.The central façade consists of three central doors and two strong buttresses, which are the essential decorative motif of the cathedral. Also beautiful is the western portal, with three doors, which is also rich in statues including the 'Stories of Adam and Eve'. The side faces are also very elegant, with buttresses soaring upward, repeating the theme of the main façade.